For all of you who love the new “Biting Mr. Bittman” series, I have exciting news. I’m expanding it! Yes, it’s true. After consulting with my business development team (aka KMLake), I’ve decided to announce a new, weekly series called Salt-Free My Recipe. It’s like Pimp My Ride but for food. Without salt. And a lot fewer hub caps and decals. But there is a catch – it requires your participation. Just like Mr. Bittman has (unknowingly) been submitting his recipes to Sodium Girl for salt-free transformations, now you can send your favorite dishes to SG for a sodium-free make-over as well. Ok. Let’s say your grandmother makes a totally rockstar salad with quinoa, tomatoes, and avocado. To which I say, your grandmother is awesome. But while the recipe sounds simple and easy, there’s one problem. 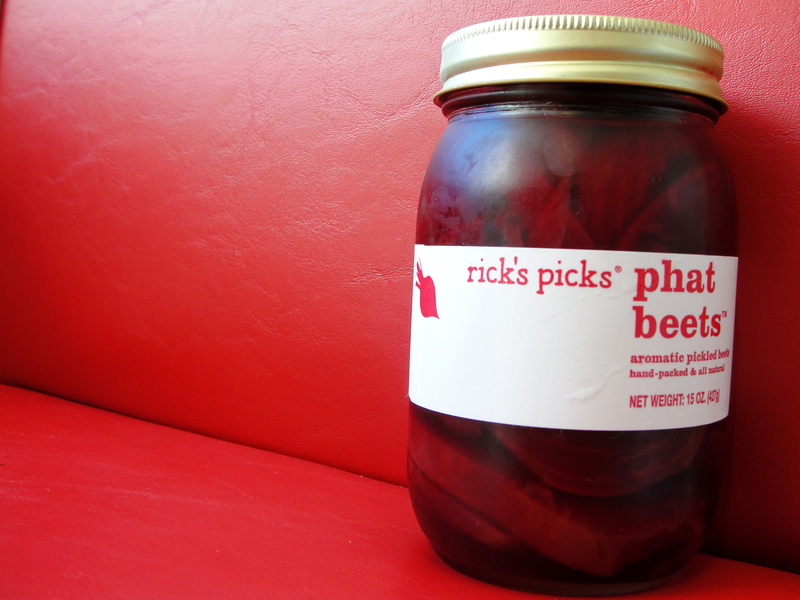 She also uses her famous pickled beets, which taste more like the ocean than a backyard garden. So you think, sadly, that because of your dietary needs you will never be able to enjoy grammy’s picnic delicacy again. Tear. But this is where I come to the rescue. Simply wipe that tear aside and send the recipe to sodiumgirl@gmail.com, or include it in a comment below. Then, I’ll swap out the salt-heavy ingredients with some really genius substitutions and post a Salt-free’d Recipe each week. and make life a little easier. And since we are already making changes, I might also tell you to add some chopped chives and fresh radish – which has a naturally strong, pepper flavor on its own – to the dish, so you can really spice things up. Depending on the number of entries, I will either post the one and only recipe I receive on the site, or, for some real fun, I’ll pose a poll to the rest of you, the loyal readers, to decide which dish (of the thousands I’ve received) to make. Isn’t that exciting? Yes it is! 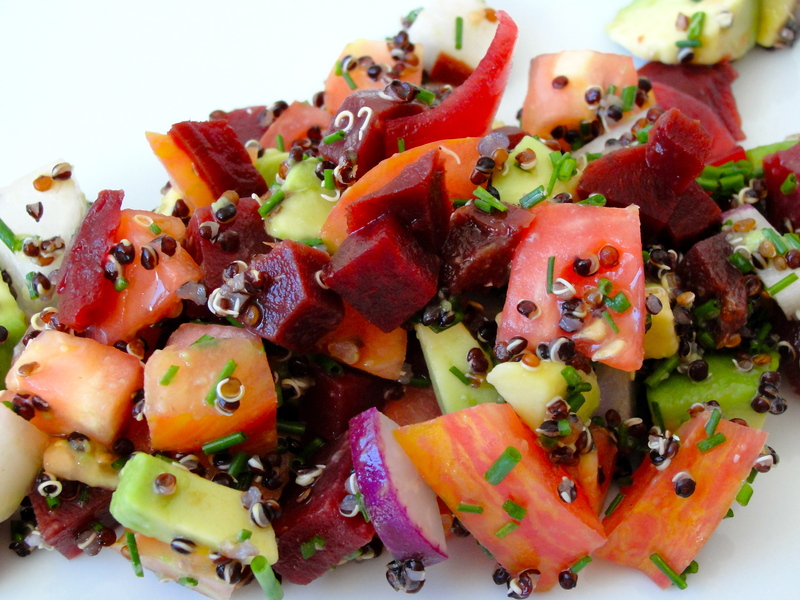 To get things started, check out Grammy’s Salt-Free, Pickled Beet Picnic Salad below and start sending me your sodium-free recipe queries – they can be from websites, cookbooks, or just your imagination. So start your engines, get those creative juices flowing, and let’s get interactive! 1. 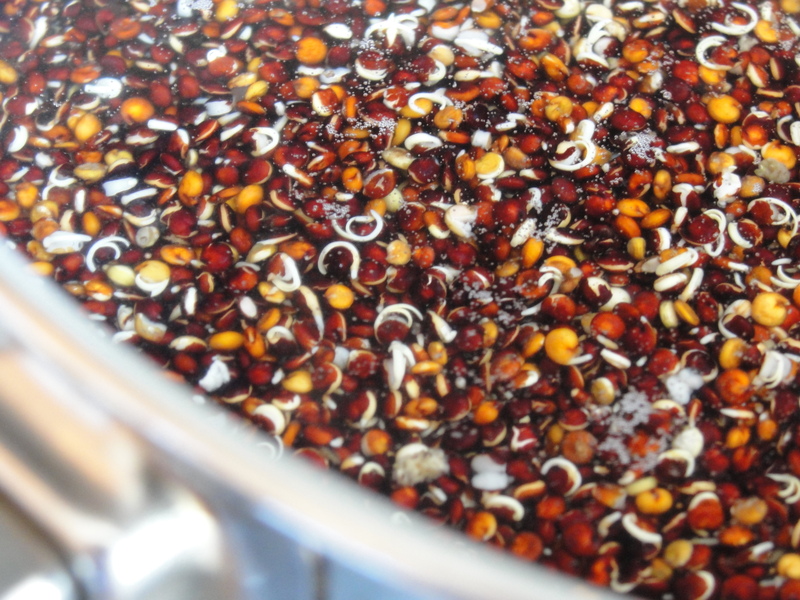 Soak the quinoa in a cup of water for 30 minutes, or until the grains begin to sprout their white tendrils. 2. Put quinoa and water into a small pot over high heat and bring to a boil. Lower the heat to medium and continue to cook until all the water is absorbed – about 15 minutes. 3. While quinoa is cooking, wash and dice all the vegetables – avocado, radish, tomato, and pickled beets. 4. Take pot of quinoa off the direct heat and allow to cool for ten minutes. 5. 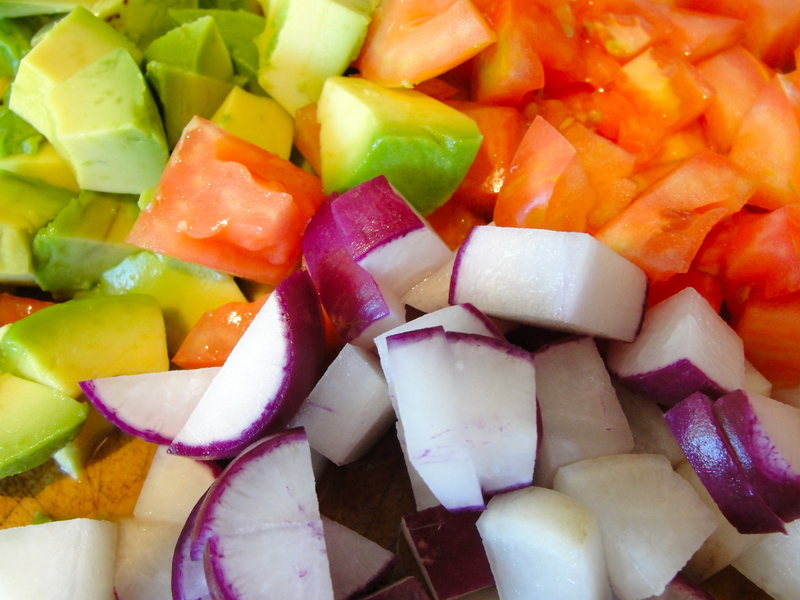 Add the diced veggies directly to the pot (to avoid extra cleanup) and mix. Sprinkle chives on top and serve. This salad looks amazing. Beautiful bright colors and I love all the ingredients. Ah, Sodium Girl does it again! She wows with her humor, her creative writing flair, her imagination, enthusiasm and adorableness ( not a word?) and she’s totally into collaboration! What could beat that?! You truly rock, SG!! OH, and I forgot to say that the salad looks absolutely off-the-charts delicious. I am running to my recipe collection right now! !